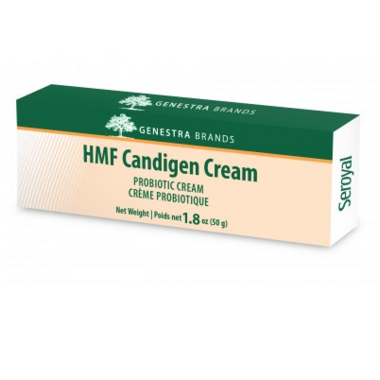 Genestra HMF Candigen Cream is a female probiotic cream including 100 milllion CFU per gram. Includes garlic powder and Rosa damascena flower oil HMF Candigen Cream provides two strains of Lactobacillus. One gram (1 g) of cream contains 80 million CFU of Lactobacillus acidophilus and 20 million CFU of Lactobacillus gasseri, in combination with 2.47 mg of garlic (Allium sativum) clove powder. For maximum benefit, HMF Candigen Cream should be used along with HMF Candigen probiotic suppositories.